Used as a prayerbook as well as a book of hymns for church services, the psalter in the later middle ages was often produced with a calendar and additional prayers. Eventually it was combined with an abridged version of the breviary, the prayerbook used by monks, to form the special lay prayerbook, the book of hours. This psalter represents an important stage in this development as it took place in England. It is one of the earliest psalters to include the Hours of the Virgin, a special set of devotions taken from the breviary. Also it is the earliest of a line of richly decorated psalters which were probably made at Oxford, in the workshops by lay scribes and artists, an industry which grew out of book production for the university. The Book of Psalms belongs to the Old Testament and does not mention Jesus. During the middle ages, however, Christian theologians understood the psalms as prophecy of Christ and tried to demonstrate their unity with the Gospels by linking their themes and individual verses with Christian themes. In this psalter, Psalm 109 (110, 'The Lord said to my Lord, "Sit at my right hand while I make your enemies a footstool for your feet.") 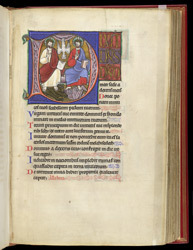 begins with a large historiated initial showing the Trinity seated in heaven. Inspired by the first verses of the psalm, Jesus sits at the right of God the Father, both with demons under their feet.